Firefox 3.6 Alpha 1, Mozilla Thunderbird 3.0 Beta 3, Windows 7 Release Candidate (RC) Version, and Firefox 3.5.2 Stable Version. You have heard so many terms before. 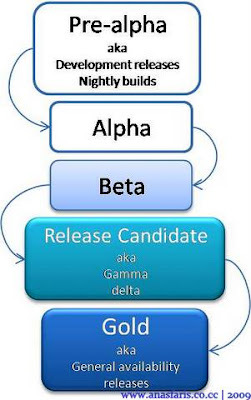 This is the software release life cycle which describes the stability and development of software before final release. Code complete, potential to be final product, ready to release unless fatal bugs emerge. Last stage, script is complete and finished. often referred as version 1.0 with any future updates making that number go up. wow. so its like that. thanks for the info! bile windows 7 RC ni nk kuar? penghujung ogos ek?